This composite picture shows the Orion Molecular Cloud Complex with the Flame nebula (NGC 2024) featured in the center of the image and the Horsehead nebula making an eerie appearance near the right hand corner. 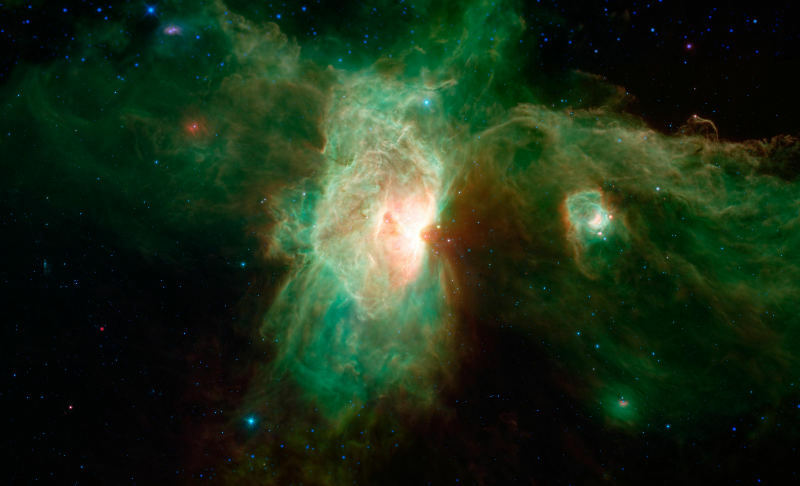 This part our vast universe is about 1,200 light-years away from Earth and most of the data in this picuture was captured by Spitzer Space Telescope’s infrared cameras. The blue and green represent “hot stars” with the blue light emitted at a wavelength of 3.6 microns and green being 8 micron light. The relatively “cooler” parts of this system are mostly dust clouds that are areas in red, measured at a 24 micron wavelength. About 17,000 light years from Earth lies the system with a very bland name of PSR B1509-58. It consists of a spinning neutron star nebula surrounded by a cloud of energetic particles. This composite image includes X-ray emissions captured by the Chandra X-ray Observatory (seen as yellow-gold coloured portions) and data from the infrared spectrum captured by the Wide-field Infrared Survey Explorer (seen in red, green and blue). 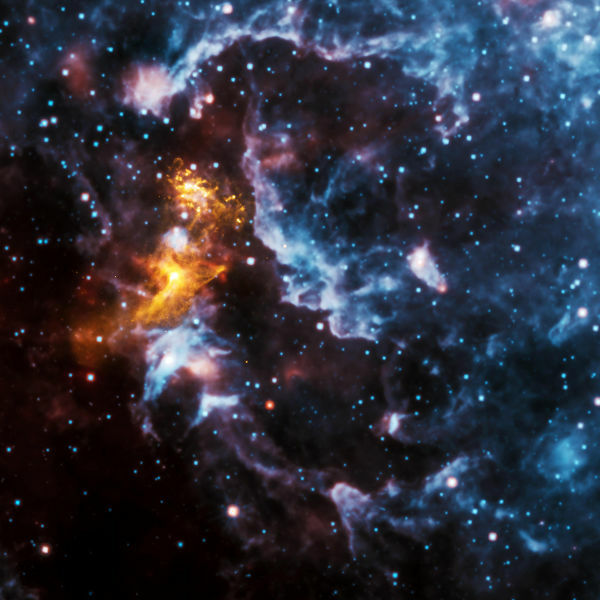 Many people report seeing a shape that looks like a face within the infrared data from this neutron star system. 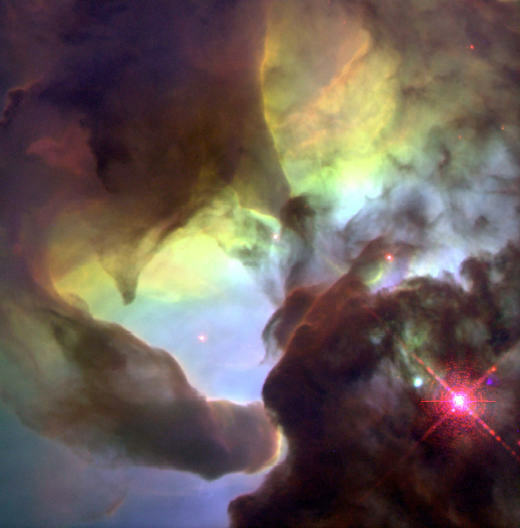 5,000 light years from Earth, towards the Sagittarius constellation, lies the Lagoon Nebula (Messier 8). Hubble Space Telescope took pictures in 1995 using its Wide Field and Planetary Camera 2 (WFPC2) which were combined by NASA to create this image of what looks like violent twisters or funnels occurring within this nebula. These twisters are believed to be formed due to the combination of large difference in temperature between the hot surface and cold interior of the clouds and the pressure of starlight. The bright pinkish light near the bottom right of the image is the central star, O Herschel 36, which is also the main source of ionizing radiation for the region. 1,400 light years away from Earth lies the Flame Nebula in the constellation of Orion. 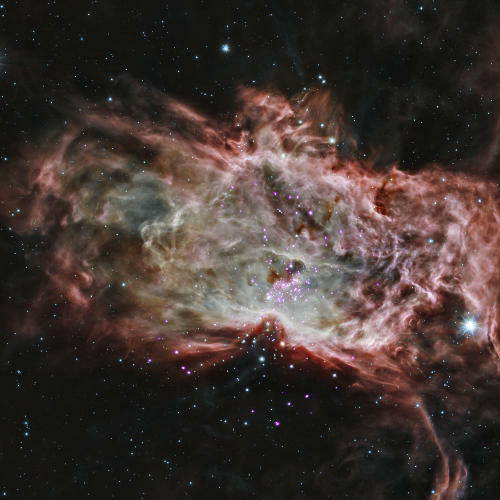 Within it lie star clusters that are being studied by astronomers as they try and learn more about the birth of stars. 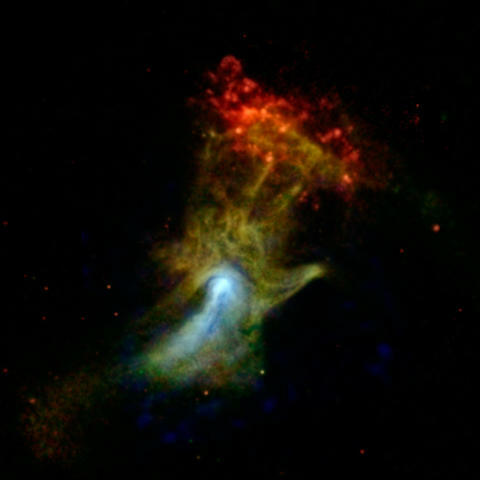 This composite image was created using data from the Chandra X-ray Observatory and the Spitzer Space Telescope. According to the latest research which combined the Chandra and Spitzer data, the stars at the center of this cluster (NGC 2024) could be approximately 200,000 years old while those on the outskirts are likely to be about 1.5 million years in age.